Born in 1984 in Moscow. Vladimir Gorlinsky studied at the Moscow Conservatory with Vladimir Tarnopolski. His music is heard at Witten Days for New Chamber Music, Darmstadt Summer Course, ACHT BRÜCKEN Festival (Cologne/Germany), pgnm festival, Kasseler Musiktage, SWR and WDR concerts (Germany), Venice Biennale, Festival d’Avignon (France), Gaudeamus Muziekweek (The Netherlands), Wien Modern, Impuls (Austria), Transit (Belgium), ISCM (Hong Kong, Vienna), 2D2N, Gogolfest (Ukraine), Moscow Autumn, Moscow Forum, among others. 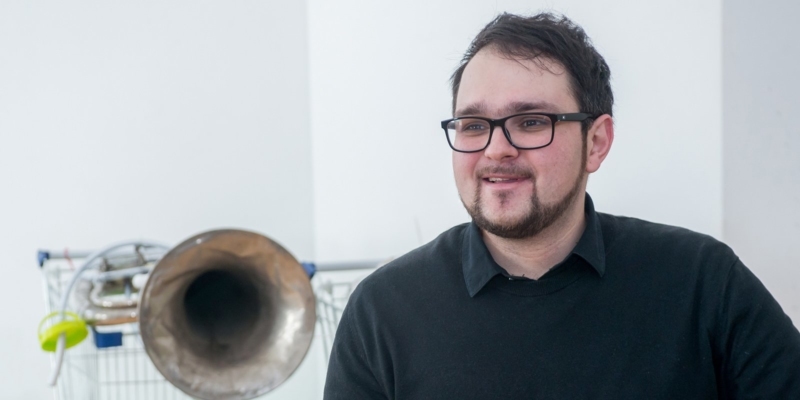 Between 2014 and 2015, he took part (as a composer and dancer) in the creation of theatre piece The moments in cooperation with the choreographer Olga Tsvetkova.In may 2016, he organized the laboratory Dreamtory – for music research of human perception of time as well as the research of hours-long improvisations with possibilities to play and drift into sleep during performance. Since 2015 Vladimir Gorlinsky is a composer of the Stanislavsky Electrotheatre.